James Wan, considered one of today’ most-sought horror filmmaker, who frightened the movie going public with his works in “The Conjuring,” “Saw” and “Insidious” produces “Haunted” and directed by Will Canon who used multiple shooting styles and partly shot via found footage. The James Wan produced horror “Haunted” (also known as “Demonic”) brings a detective (Frank Grillo, “The Purge: Anarchy”) and a psychologist (Maria Bello, “Lights Out”) together to investigate the slaughter of five amateur ghost hunters in a house that is said to be haunted. Up and coming actor, Dustin Milligan who also appeared in the same genre such as “Final Destination 3,” “Slither” and “Shark Night” plays the only survivor of a group of teens who were killed while trying to summon ghosts in “Haunted.” His character John, being the survivor, is tasked to explain to the paranormal investigators of the horrifying demise of his friends. “He starts the film as a skeptic before arriving at the house and after everything that happens. He struggles to believe that what is happening to him and his friends is the result of something supernatural and he can’t believe what he is seeing. He’s in total shock after the events, he was a great character to play,” shared Milligan about his character in the movie. 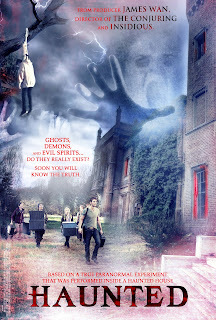 “Haunted” will open August 10 local cinemas nationwide from Pioneer Films.